Ricciardo appeared to benefit from a tow from Raikkonen to pip his team-mate by less than a tenth of a second. The Ferrari driver's first run in the Q3 top 10 shootout was good enough to secure pole position by 0.179 seconds from Mercedes' Lewis Hamilton after a lock-up spoiled Vettel's second attempt. But in the dying seconds of the session, it seemed the other Ferrari of Kimi Raikkonen was set for pole position having set the fastest times of all in the first two sectors. He threw away that time by being too aggressive on the throttle out of the Turn 16 left-hander, which led to him losing enough speed that he did not improve on his first-run lap. This put Raikkonen down in sixth place, behind Mercedes driver Valtteri Bottas and the Red Bulls of Daniel Ricciardo and Max Verstappen. The top five qualifiers all made it through Q2 on supersofts, but Raikkonen will have to start the race on ultrasofts as early mistakes in Q2 meant he had to rely on a last-gasp lap on the softest compound to jump from 15th to first and make the pole shootout. Nico Hulkenberg was ninth fastest, although he has to serve a five-place grid penalty for a gearbox change and will hand the position to Renault team-mate Carlos Sainz Jr.
Lance Stroll came close to knocking Ricciardo out in Q2 with his late lap, which was just 0.103s slower than the Red Bull driver's supersoft pace and good enough for 11th. Fernando Alonso was 13th for McLaren having been shuffled down from ninth place after the first runs despite improving on his second set of ultrasofts. Sauber's Charles Leclerc was 14th, while Haas driver Kevin Magnussen was just under seven tenths down in 15th place after lapping over a second slower than he had in Q1. Stoffel Vandoorne was the quickest driver to be eliminated in Q1 thanks to Stroll's late lap of 1m44.359s, which was 0.130s quicker than the McLaren driver. 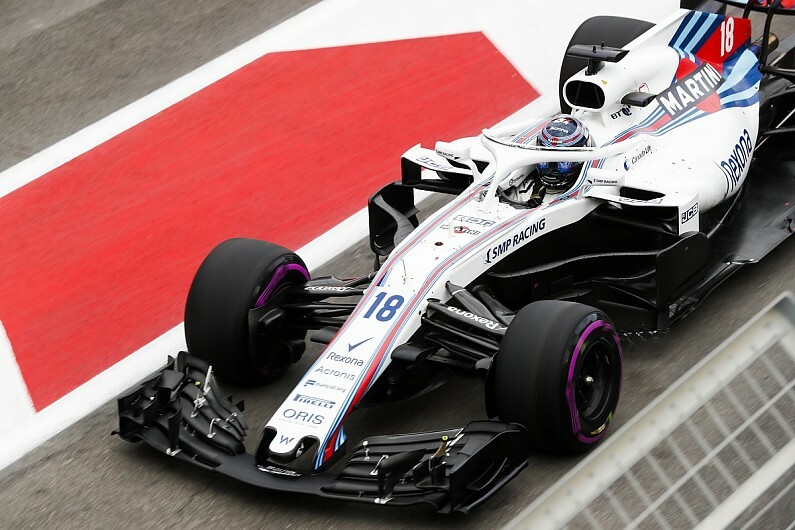 That also relegated Pierre Gasly to 17th after the Frenchman's second run was ruined by an incident with Toro Rosso team-mate Brendon Hartley. Hartley was circulating slowly with a puncture at Turn 14 when Gasly happened upon him at the fast left-hand kink while on a lap that looked quick enough to get him into Q2. Gasly just managed to swerve around the right side of Hartley and narrowly avoid contact, but he mounted the outside kerb and ended up in the Turn 15 escape road before returning to the pits - labelling what happened "unacceptable" over the radio. "I was trying to get out of the way of Gasly but it was too late," said Hartley over the radio. "I feel pretty stupid about Gasly." Hartley had to abandon his quick lap from the first run, and did not have time to have another run after his puncture so ended up down in 19th behind Ericsson having not set a serious lap time. Haas driver Romain Grosjean was 20th as he did not set a time thanks to stopping with a gearbox problem early in Q1.